Categories: Design, Pretty Things, Shop | Tags: deco, tape | Permalink. Not too long after we found out we’re having a little girl, I ordered two of my first baby dresses online. I had gotten a catalog for Tea Collection months ago, although I’m not sure how I ended up on their mailing list. Fate, maybe? I’m not on any baby or children-related mailing lists that I know of. Anyway, I just LOVED their asian-inspired styles. So once I knew, I got on their site to find that they were having a summer sale and that most of my favorites were 50% off! How could I resist? It was kind of weird buying outfits in next summer’s sizing, considering she is not even here yet, but I didn’t want to loose this opportunity. I rarely see baby stuff I like this much, and their fall collection is Norway-inspired, which doesn’t really impress me the same way. Categories: Baby, Shop | Tags: Baby, clothes, modern | Permalink. Okay, finding a swimsuit is hard, but finding a maternity swimsuit is ridiculously difficult. And it doesn’t help that I am as picky as they come on this topic. As a matter of fact, my favorite pre-pregnancy two-peice is a red halter-style bikini top with boy short bottoms. It is a few years old now, but back then I drove to three different Targets in order to finally find my size. So you can see, during the rare times that I find one I like, I am willing to go the distance. After doing a fair amount of internet searching and perusing the racks at a couple nearby stores, I saw a lot of ugly maternity suits. I really wanted PLAIN – no polkadots, animal prints, plaids, ruffles or hardware. It is bad enough that my stomach is becoming an ornament in itself. I don’t want to be baring it to the world either, so I’ll just take a one-piece (or a two-peice with respectable belly coverage), thank you very much. I deliberated for quite a while, but knew with the summer months ahead and a pregnancy swim class starting soon, that I had to make a decision. I’m kind of embarrassed to even admit which one I prefer, but it might just end up being my one big splurge. Am I just being crazy? Categories: Life, pregnancy, Shop | Tags: maternity, pregnancy, shopping, swimsuits, swimwear | Permalink. I was at the post office the other day to pick up a new supply of first-class stamps. David wanted the Marvel Super Heroes, but they were out, so I got a sheet of the Forever stamps instead. I also picked up a sheet of these pretty Polar Lights stamps, too, depicting photographs of aurora borealis and aurora australis. The southern lights, aurora australis, are the polar lights as seen in the Southern Hemisphere. Auroras often appear in visual forms that combine aspects of arcs, curtains, and rays; this photograph shows an aurora over Antarctica, where hints of red indicate particularly strong magnetic activity in space. The northern lights, or aurora borealis, are a common sight in the northern polar region; here they appear over the Talkeetna Mountains in Alaska. During particularly intense magnetic storms, aurora borealis can occasionally be seen in some of the lower 48 states as well. Speaking of stamps, I was reading another blog (was it this one?) that mentioned these Swedish Fashion Stamps that I thought were really artsy and cool. I bookmarked the Postal Shop but not the blog, although I was able to find a larger image of the stamps here. I’ve always liked stamps, but I’ve never been a collector (not counting the random old ones that sit in the bottom of our stamp drawer, like a pair of 32Â¢ Marilyn Monroe stamps that I can never bring myself to use). David has several sets that his mom has framed from him in the past, some cartoon ones and a nice collector’s sheet of Hawaiian surfing legend Duke Kahanamoku. And for those of you who don’t already know, you can even make your own postage stamps. I made a set for my sister in-law a couple years back, using a photo of her new baby boy, and they were adorable! Check ’em out here. Categories: Art, Design, Shop | Tags: aurora borealis, fashion, postage, stamps | Permalink. Now, if only I could actually afford to buy a pair! Categories: Design, Environment, Shop | Tags: eco, patagonia, shoes, Travel | Permalink. The photos above are from Shim+Sons. The button crafts are available in their “shoppe” along with some nicely designed paper goods. I also really enjoy their blog and was pleasantly surprised that they were also Portland-based. Here are links to two really good tutorials, one for fabric covered thumbtacks at How About Orange and a fabric covered button tutorial at Little Thing by Magda K. Both of these ladies are really talented and do amazing work. Categories: Design, Etsy, Shop, Things to Make | Tags: buttons, Crafts & DIY, custom, magnets, pins, tutorials | Permalink. This past weekend I finally broke down and bought a new imac. 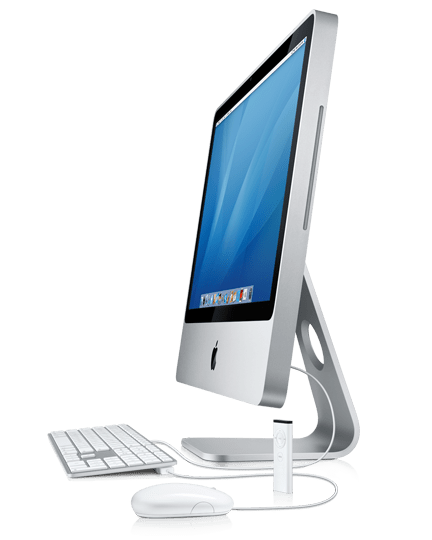 Somehow I missed puremotif’s Mac Dreams post â€“ we could have been commiserating together – apparently she was also struggling with the decision to buy, although she eventually chose a laptop. I can only hope my old ibook will hold out a little bit longer. Working on my old G4 was just getting too painful… waiting for items to load or save, not being able to work properly on large files, and seeing the “wheel of death” way too often … it was just too much. I think I was beginning to loose my sanity. Plus, while working at my old design firm I got really used to scrolling with a mighty mouse and not just an optical. It’s kind of embarrassing how we get used to new technology and feel like we can’t live without it. So, why did I go with an imac? Price, really. Since I’ve been working at home more than ever (which is still not as much as I’d like) I realized that it only made sense to have the proper equipment. Although, in some ways, I wish I could have waited, and maybe purchased a G5 tower. Besides being stronger and faster, it would have lasted much longer due to its many user customizable and upgradeable features. With the imac, I learned, the only upgrade I can do myself, without an apple certified specialist, is adding memory. On the other hand, lucky David already has a G5. You’d think we might have been able to split time on it a little bit better, but when two graphic designers get simultaneous jobs, it is hard to sit and wait around (me) knowing that clients expect a reasonable turnaround. Also, we both do other computer-related activities like Age of Empires/surfing the web/emailing (David) and blogging/photo archiving/surfing the web/emailing (Me). Actually, it is downright scary how long we sit in front of our computers – our chairs maybe 2 feet away, yet world’s away in our heads. Categories: Design, graphic design, Shop | Permalink.